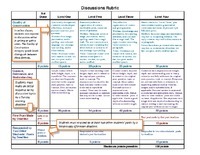 Assignment rubrics have emerged as an important tool in communicating learning outcomes and expectations. Here we have collected a variety of rubrics used by GBC faculty for a range of assignments and activities. Discussions are an important component of many of our online courses, but present real challenges when assessing students. Kathy Schwandt contributed this Discussion Rubric and provided some commentary to explain her approach to these kinds of assignments. 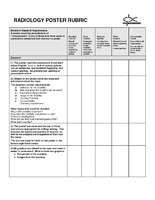 Of particular interest in this rubric is the incorporation of video into the rubric for assessment purposes. Visual projects present a different set of issues in assessing student performance. For the Imaging Modality Poster project discussed on the Projects page, Mary Doucette has developed this rubric covering both the content and the presentation expected of students in successfully completing the project.